Hey, guys, what's happening. Kara in the house! Four months ago today, the doctors pumped my mother full of drugs and ripped open her stomach to bring me into the world. Hooray for modern technology! And Vicodin, according to my mom. Certainly merits a post, don't you think? Let's see. What to report? I just learned to laugh, I spend hours at a time sucking on my hands, and I can finally last longer than two hours in between feeds. Go me! I'm also the right size for some very peculiar onesies. 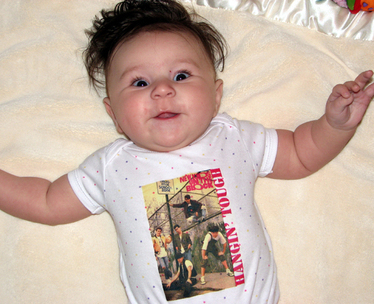 I've been told I got these from a special blog auntie who creates one-of-a-kind clothing for babies, clothing that references dated pop-culture icons who were all the rage thirty-seven million years ago. Take this one, for example. Who is this Kyle person? What isn't his fault? Did he scream his ever-loving head off in a McAlister's Deli and poop all over his clothes, causing his mother to Lose It in front of dozens of judgemental strangers who could only stare as he banged his legs against the cheap plastic changing table while sobbing over life's injustices? Because sometimes, dear readers, this cannot be helped. Now that you mention it, though, Kyle is quite dreamy. Perhaps he would consider accompanying me to Babies R Us? Picture this: a dimly lit sales floor, my Baby Bjorn, a Baby Einstein serenade.... I get weak in the knees just thinking about it. Is it hot in here? Goodness. Now THESE guys I know! Jump, jump! Joey Joe will make ya, jump jump! Jordan Knight will make ya-- Wait, what? Hold on, my mom's calling me. You mean to tell me this isn't Kris Kross?! Crap. But no worries. "Step by Step" is quite delightful. As are drug-free school zones. This guy's OK, even if he is trying to one-up me for Best Hair. Clearly, I have the best hair. So what if there are bald spots above my ears? It's my new take on the mullet: Business on the sides, party on the top. 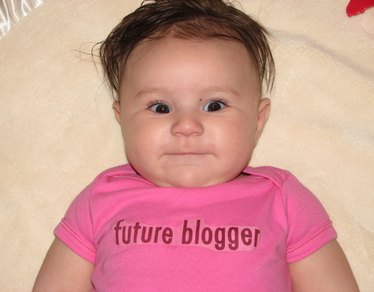 "Future Blogger" my tush. The time is now, baby! Momma, eat my dust. Oh Kara, you are too cute. Thanks for the laughs! ps. Happy 4 month birthday. Do I smell cake? Too cute! 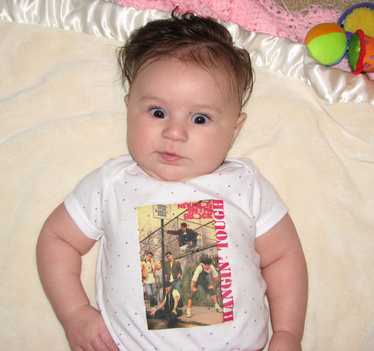 And Isabel did a fantastic job on the onesies! My coworker just asked me "what are you giggling about?". 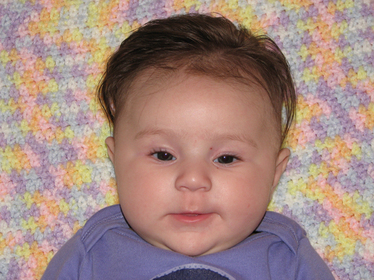 "Oh nothing, JUST THE CUTEST BABY IN THE HISTORY OF THE INTERNET!" Because seriously, to precious. And I LOVE seeing May and my handy-work in action. (The NKOTB one is especially appropriate since they are getting back together.) And dude, Rhett Miller is hott. Oh, how adorable!! And Isabel, how talented! Happy 4th month, Kara! You're the coolest. Oh my dear Lord! I was not prepared for the cuteness in this post!! Happy 4 months, Baby Kara!! Kara, you have the best pop culture wardrobe of anyone I've ever seen. And at four months, that's quite impressive. Ask your Mommy how McAlister's was... I've been wanting to try it! 4 months old!?! She's so cute - and I love, love the hair. The new mullet - I'm laughing out loud! Kara, this is your best post ever. Keep it coming with the pics. I'm loving the business on the side. Those are fabulous onesies!!! And she is darling as a model! 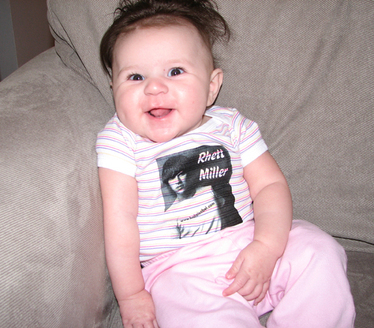 She seriously has the greatest facial expressions ever seen on an infant. And also, you pull off the baby narrator without annoying me in the least. A triumph, I tell you! Happy Birthday Kara. 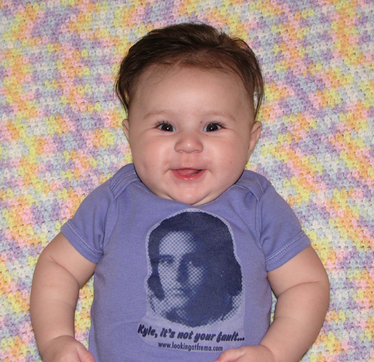 You certainly are stylin' in your lovely clothes from Auntie Isabel. I just re-read this and got really excited to see McAlister's Deli mentioned! The original McAlister's is in my hometown of Oxford, Mississippi! It used to be a garage, then they turned it into a deli. (You know us crazy southerners.) Anyway, McA's has the best honey mustard in the world. Kara, get your mom to get you some Kentucky Pie! Happy day baby! I hope now that you have hit the big four months that you are sleeping better. Kara, that was a fabulous post. Happy four-month birthday to you! And MY GOD, you have incredible hair...so cute! Wow, Kara! You are a better blogger than me and I'm so much older! And you're so much cuter! I love your hair! Love the commentary - ha ha! Too cute! Her expressions are unbelievable! What an expressive baby! Super cute.